Stick framing of today has been the go-to construction method for almost two centuries. Over this time, there have been many changes and improvements in building methodology as well as construction materials used for framing and insulation. One such change was the invention of the Structural Insulated Panel, or SIP. So, what are the differences between SIPs and stick framing? Insulspan® Structural Insulated Panels (SIPs) use a continuous core of expanded polystyrene (EPS) foam structurally laminated between two boards of performance-rated oriented strand board (OSB). While SIPs can be used for walls or roofs, the best performance occurs when SIPs are used to create an entire energy-efficient shell. 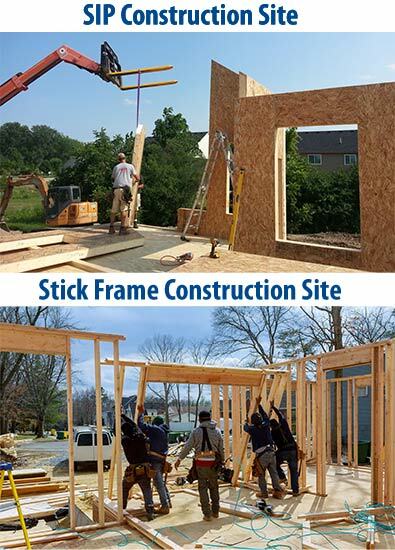 In stick framing, all lumber for the home is delivered to the job site as individual pieces. A framing crew is needed to measure, cut, and build each wall section individually on the job site while making sure everything stays plumb and level. Once framing is completed, it must be sheeted before the insulation subcontractor can come at a later date to either place batt insulation or spray foam insulation into the cavities. Using Insulspan SIPs shortens construction time by combining framing and insulating into one step. In addition, the use of SIP panels reduces framing labor needs by as much as 55% according to a BASF study conducted by the RS Means unit of Reed Construction. [i] This is because Insulspan’s panels are accurately prefabricated based on the building’s design specifications and delivered to the job site just in time for installation. Detailed SIP drawings with exacting instructions for panel installation accompany the SIP walls and/or SIP roof panels. Insulspan can also manufacture and deliver your panels Ready-to-Assemble (RTA) with all the lumber components pre-cut and pre-installed in the panels where possible. This prefabricated building method significantly reduces the amount of measuring and cutting that normally occurs on a stick frame job site. Traditional stick framed homes and structures are less energy efficient than SIP homes because they are more prone to energy loss (or gain if the climate outside is warmer than inside the home) because of thermal bridging and air leakage. Learn more about Insulspan SIP’s superior energy efficiency. For instance, about 40% of an existing home’s energy loss is from air leakage. [ii] Air leakage is measured in air changes per hour (ACH). The current International Energy Conservation Code (IECC) requires a typical stick framed home to have an ACH of 3-5 depending on climate zone; a SIP home can achieve air leakage as low as 0.2 ACH using energy efficient construction procedures. Simply reducing the amount of ACH can significantly lower your energy bills. There are other advantage to reducing the number of air changes per hour. For example, there are fewer drafts, meaning less dust and other allergens enter your home. Learn more about the Health & Comfort offered by Insulspan SIPs. A SIP building has a tighter energy envelope than its stick frame counterpart. By eliminating much of a home’s air leakage, your HVAC system doesn’t have to work as hard heating and cooling interiors. The result – you can install a smaller, less expensive, mechanical system while still maintaining the interior comfort you require. When comparing SIPs to stick framing, there is no doubt that building with Insulspan SIPs saves money. It’s a savings both during construction and over the life of your structure. Contact Us to start your new project today.